The Shipyard Complex – Mount Pleasant, SC – Target Technologies International Inc.
Construction of a 20-acre waterfront baseball complex with five playing fields and an indoor training building is well under way on the eastern banks of the Wando River in Mount Pleasant, SC. This one of a kind, state-of-the-art facility has been described as a “Disneyland for baseball” in a most unique and beautiful setting. 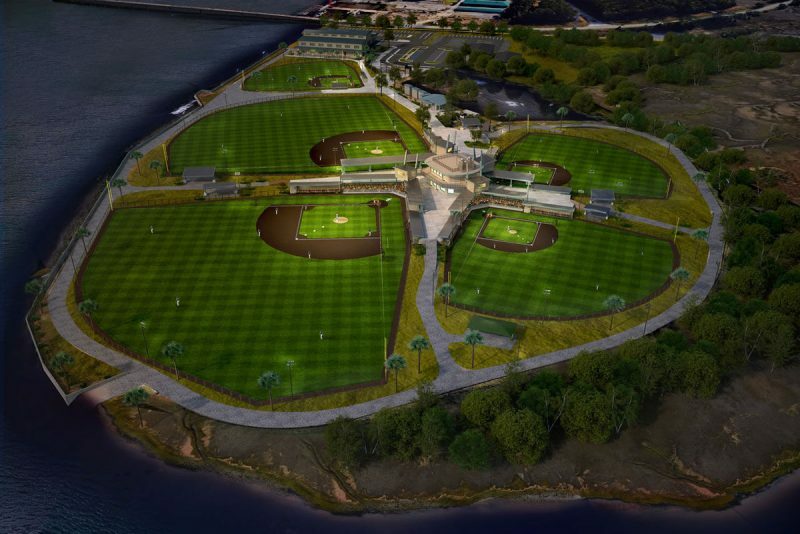 The Shipyard Park complex is a place for players to train and compete, from youth sports to training programs for collegiate and even major league players. An estimated 400,000 square feet of synthetic turf will be used to create five baseball fields and a large, warehouse-like building suitable for indoor practice. Opening date will depend on the weather, as construction moves forward. Target Technologies is very pleased to supply the high-quality infill sand right from our South Carolina plant.